Nathan asks: What’s the difference between green and black olives? Green olives are soaked in a solution containing lye, then fermented in brine for anywhere between 6 to 12 months after being picked. The longer the olive is fermented, the less bitter and more flavorful it becomes. Green olives are usually pitted, and often stuffed with items such as pimientos, anchovies, jalapenos, garlic or onions. Black olives are also soaked in lye to lessen their bitterness, then cured in brine, but rarely stuffed. Other than that, there really isn’t much of any difference. On the minor side of things, due primarily to preparation, green olives contain about twice as much sodium as black olives, while black olives contain more oil than green. But in the end, the main difference really is just when they were picked. The cultivation of olive trees can be traced back more than seven thousand years. 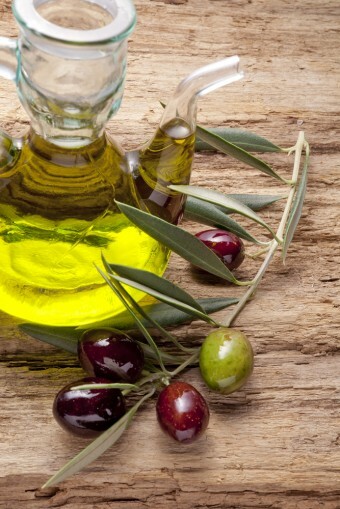 As far back as 3000 B.C., olives were grown commercially in Crete. While olives originated in the Mediterranean, they are now grown in many places with similar climates, such as South Africa, Chile, Peru, Australia, New Zealand, Argentina and California. The type of olive grown depends on the region. The Kalamata olive is grown most often in Greece. Kalamata are usually left on the tree to ripen to a dark brown color and have a sweeter fruit flavor than most olives. They are often split partway open to allow the curing brine to penetrate the “meat”. The Manzanilla is the top olive produced in California. It is a medium sized green olive with a slightly bitter, nutty flavor, and excellent for making olive oil. In addition to being a healthier alternative to vegetable oil, olive oil has been considered sacred since ancient times and is still used in religious ceremonies today. It was used to anoint kings in ancient Greece, for grooming bodies and hair in Ancient Rome, burnt in the sacred lamps of temples, rubbed on the first Olympic athletes to cure muscle aches, and was the oil used to fuel the “eternal flame” of the original Olympic Games to honor the goddess Hera. Victors in the games were also crowned with wreathes made of olive branches and leaves. Thanks to being extremely hardy, due to being drought, disease, and fire-resistant, olive trees can live to many centuries, and even sometimes millennia. Many of the olive trees in the groves around the Mediterranean are several hundred years old, while a number of individual trees are more than a thousand years old. Black olives are graded based on size- small (3.2 to 3.3 grams each), medium, large, extra large, jumbo, colossal, and supercolossal (14.2 to 16.2 grams). A 15 gram serving of green olives contains 20 calories. The same in black olives contain 25 calories, due to the larger amount of oil usually present. It is estimated that there are about 865 million olive trees in the world. Further, there are approximately 9.6 million hectares of land (twice the size of Switzerland) planted with olive trees. For reference, this is more than twice the amount of land devoted to apples, bananas, or mangoes. The only commercial trees grown more than the olive tree are coconut trees and oil palms. Olive trees come from the Olea europaea plant family, which also includes species such as lilacs, jasmine and forsythia. Doesn’t black olives have less salt than green olives?? I just ate a can of jumbo black olives. Hated all olives as a kid. now i can’t get enough of them. No salad of mine goes w/o green, black and Kalamata olives. I love blue cheese stuffed olives too.